The Buddha’s Discourse of the Amitabha Sutra, or Shorter Sukhavativyuha Sutra (Chn: 佛說阿彌陀經), is a Mahayana Buddhist text associated with Pure Land Buddhism. It was translated from Sanskrit into Chinese by the Tripitaka Master Kumarajiva in the beginning of the 5th century. 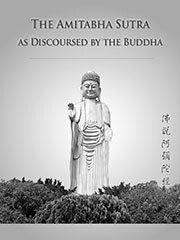 The bulk text itself consists of the written version of a talk which the Buddha Sakyamuni gave at the Jeta Grove in Sravasti. The talk concerns the wondrous adornments that await the righteous in the Western Pure Land (Chinese: 西方極樂國), as well as the beings that reside there, including the Buddha Amitabha. The text also describes what one must do to be reborn there. The sutra is often recited as part of the Evening recitiation (Chinese: 晚課). It is also frequently recited at Buddhist funeral services, in the hopes that the merit gained by reciting the Sutra may be recieved by the departed. The Sanskrit version of the Dharani is pronounced:Namo Amitābhāya tathāgatāya. Tadyathā: amrtod bhave, amrta siddham bhave, amrta vikrānte.Amrta vikrānta gāmine, gagana kīrti kare, svāhā! An alternate version of the Dharani begins with the characters 曩莫 (Nang-mo) instead of 南無 (pronounced Na-mo). During recitation of the Amitabha Sutra, it is correct to recite the Dharani three times. — A short guide to the Amitabha Sutra, intended for an audience with some background in Mahayana Buddhist ideas.